Adobe today unveiled Adobe Stock, a stock imagery service with deep integration into Creative Cloud tools like Photoshop, InDesign and Premiere Pro. This marks the company’s first foray into the stock content business, and the new product is the result of Adobe’s acquisition of the Fotolia stock content marketplace, which closed fewer than six months ago. Adobe Stock currently features about 40 million images (it shares its catalog with Fotolia, which will also remain online for the foreseeable future). For now, Stock only features images, but the company is looking to expand this service to video and other formats soon. Support for Adobe Stock is now integrated into the latest releases of Photoshop CC, InDesign CC, Illustrator CC, Premiere Pro CC, and After Effects CC. The service now available in 36 countries and 13 languages. As Adobe’s senior marketing director of Creative Cloud Scott Morris told us, the vast majority (about 85 percent) of stock content users today already use Adobe’s tools, and 90 percent of content that is available on stock services was created with the company’s tools. Because Adobe owns the stock content and the tools, it’s able to allow its users to do things none of its competitors can offer. For example, you could launch Adobe Stock right from inside Photoshop and pick an image you think you want to work with. Typically, you’d now have to license this image to work with it, but because Adobe has full control over the process, you don’t have to do that just yet. Instead, you can get a watermarked copy of the image, work with it to see if it fits your needs and, if it does, license it. The watermark is then removed and all your edits are applied to the purchased image. Pricing for Adobe Stock starts at $9.99 for a single image. Creative Cloud customers get a discount on the 10/images/month package, which will cost $29.99 for them (and $49.99 for everybody else). There is also a $199.99/month plan for those who need up to 750 images per month. One nifty feature here is that Adobe will allow rollover, so if you don’t need 10 images in a given month, your leftover licenses will roll over into the next month for up to a year. Adobe will freely admit that there are some cheaper services on the market, but the company believes that its overall a better value for many creatives, thanks to its integration with the Creative Cloud tools and image rollover. For now, the workflow for creatives who want to bring their own content to Adobe Stock isn’t integrated into the Creative Cloud apps. Adobe says that’s definitely in the works, though. For now, contributors have to go through a more typical web-based workflow when they want to submit images. Overall, the process is very much like that at iStock or Shutterstock in that potential contributors have to apply to the program by submitting sample images of their work. Once they are in, they will receive 33 percent of the royalties every time one of their image is sold. That’s a pretty high default rate (though very popular photographers who give services like iStock exclusive rights to their image may get higher rates that way — though they also limit their exposure). 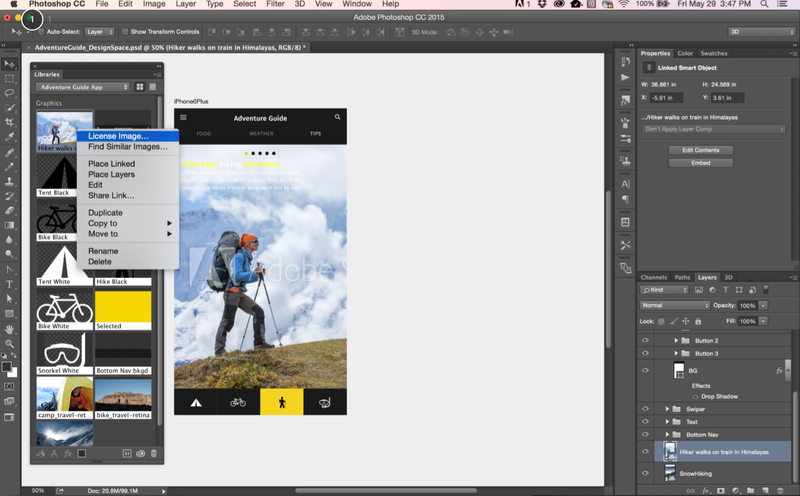 Launching Adobe Stock is a logical next step for Adobe. If you expected to get a free image or two through a Creative Cloud subscription, you’ll likely be disappointed by the pricing plans, but overall, this looks to be a very competitive offering.